Yesterday at the Press Conference the day turned into a scorcher and was a stern reminder to athletes and everyone on the island of heat and humidity that athletes could be contesting (along with the hills) in tomorrows race. In the elite line up there are returning pro’s and some first timers ready to take on Sundays challenge, we had a sampling of the pro’s and their thoughts at the Friday mornings press conference. Top Korean at IM Korea multiple times, Park Hoon Byung celebrated his 40th birthday on Thursday and is here racing after a two-year hiatus to focus on his triathlon business. 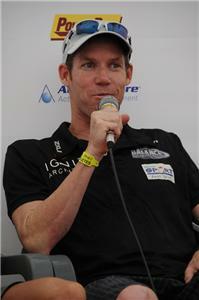 He is looking forward to doing what he loves – racing the ironman. Nipping at Parks heels is young upcoming Korean star, Ham Yeun Sik. 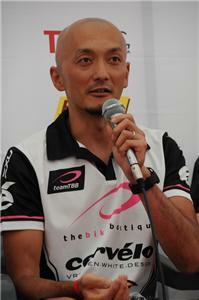 This is Ham’s second Ironman and he confidently said he is looking forward to becoming the winner! 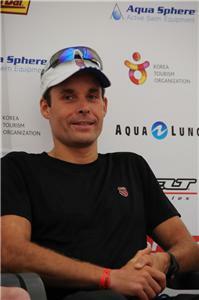 Jan Rehula (CZE) has been a resident in Korea for over six years and feels as much Korean as he is Czech. 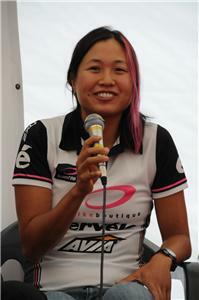 The 2000 Olympic games Sydney bronze medallist wishes for not too much rain on race day nor that it is too hot. 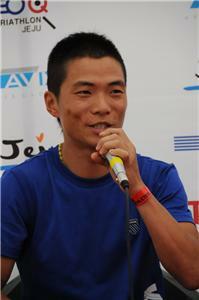 It has been a tough year for retuning athlete Hiroyuki Nishiuchi (JPN). His family were directly affected by the March 11th earthquake and tsunami in Fukoshima and Hiro and wife Maki were involved in a motorbike accident back in May. He is hoping to kick start the year with a happy ending tomorrow. Good morning from Jeju. 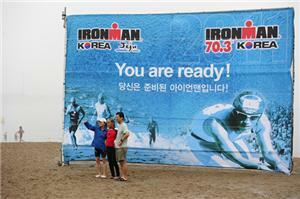 We are 30minutes away from the Start of IM Korea 2011 and the weather is looking set for a great day of racing. At this time we regret to inform you that live timing will not be available at throughout today’s race. We will however be posting splits and as much information as possible from the course to keep you updates throughout the day. 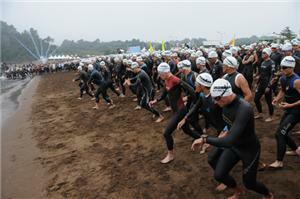 The countdown is on for IM Korea, it's going to be one tough day of racing. 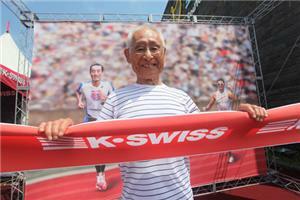 We are all keeping our fingers crossed today for our eldest competitor 79 yr old Hiromu Inada #798. He did not make the cutoff 2years ago in Japan and is racing his 2nd ever IM! We are 15minutes away from the start and we have a Korean aerobics instructor leading a warm up on the beach - quite a sight to see hundreds of wet suited athletes doing aerobics prior to an Ironman! We are 10minutes away from the swim start and all is looking good for a full IM today. 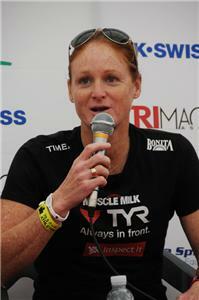 If conditions worsen then athletes may be stopped after one loop of the swim. But so far we are all systems GO! I's a mass swim start today and were are one minute away from the start. 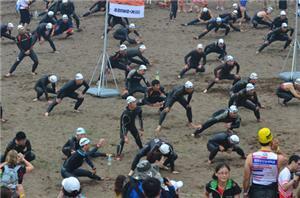 IM Korea is officially under way the athletes are in the water. Once again we apologize for the absence of Live Timing today. We will be giving as much text updates throughout the day as possible. The first three swimmers are just coming back to complete the first loop, names coming. Swimmers come out the water and take a short run up the sand around a penguin and back into the ocean for the second loop. l be posted when available. #1 Korean Byung Hoon PARK has just finished his first loop. #754 Nobuyuki TANAKA aka Joe of Ceepo bikes starts his second loop on the swim. 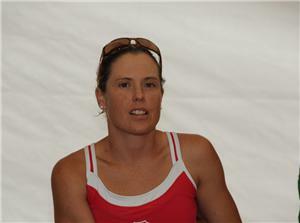 #833 Nicole GALLAGHER (AUS) is doing her first IM and is just starting her second loop. #809 Pan Seng KHA KHRANG, from Myanmar is going for your second loop. We should be having the leaders come back to the swim finish in 7-8minutes. #22 Alvin Lee (Singapore) is doing the IM and on the second loop! 79 years young #798 Hiromu INADA is starting his second loop. 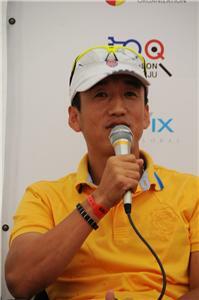 He is the eldest competitor today here at IM Korea, Jeju.